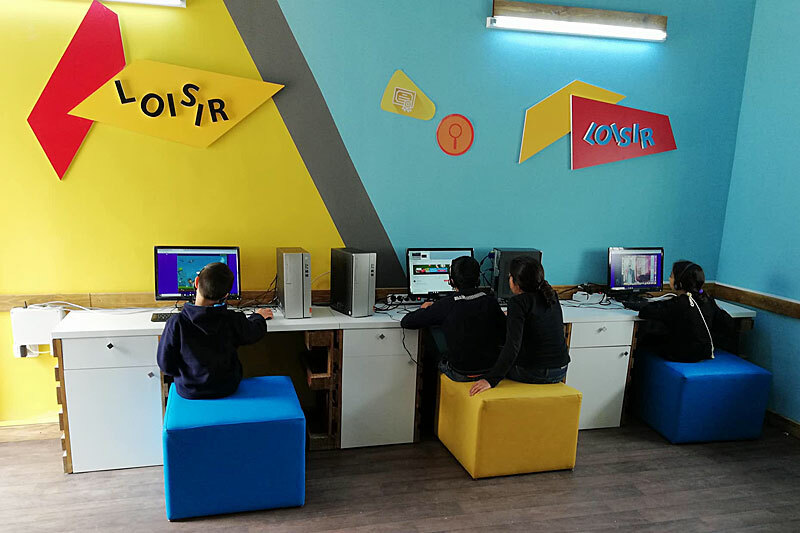 SOS Children’s Villages Tunisia inaugurated a Digital House in March 2018 in Gammarth Village, in partnership with Union Internationale de Banques (UIB). The Digital House will introduce children to technology as an essential learning tool, in a digital era where the speed and breadth of knowledge are increasing, and where social and economic transformation is enhanced through technology. The Digital House aims to provide children with interactive learning materials, and to stimulate their sense of observation, memorization, creativity, and problem solving skills. It will initiate children aged from two to six years old to reading and numbers learning on tablets, and will introduce adolescents to programming. “We had the great pleasure to inaugurate The Digital House by UIB of Gammarth children’s village, in the presence of representatives from UIB management and members of the Solidarity & Innovation Foundation and the Foundation Féminin by UIB. This Digital House reflects the commitment and willingness of our partner to support children of the village by strengthening their digital skills, an essential prerequisite for their future development and integration. A big thank you to UIB for supporting us for ten years now, and special thanks to the Solidarity & Innovation Foundation. ” Said Ms. Yosra Chaibi, President of SOS Children’s Villages Tunisia. A cosy learning space was created for children to encourage them to go regularly to the Digital House and to use the technology made available in the village. The house was equipped with Wi-Fi, video projector, parental control infrastructure, computers, Kindle eBooks, and tablets. "I'm happy because now when the teacher asks us to do a research, I can go to the digital house and look for information, select beautiful photos from the internet, and print everything". Said Emna, a 12 years old child. Throughout the school year and during summer holidays, children and adolescents will attend different creative sessions and trainings. Children aged seven years old and above will elaborate stories and illustrate them in a digital book format. Video games are also planned. In groups, children will design their own video games, create the characters, the set, and the narrative, as well as think about the playability of the game. Coding classes will also be provided by 14 women engineers from UIB, enabling children to create technology. For Kamel Neji, President of the Solidarity & Innovation Foundation by UIB, "This initiative confirms the solidarity dimension of UIB and the commitment of its collaborators, motivated by the desire to develop the potential of children and youth at SOS children's village Gammarth". He added: "The Solidarity & Innovation Foundation by UIB is dedicated to inspiring children to embrace the digital culture in order to be better equipped for nowadays societal requirements”. SOS Children’s Villages Tunisia aspires to launch the Digital House project in Mahres village in 2017 and to enrol it in Akouda village in the upcoming year. Meanwhile, Gammarth village, in which the project is already in place, will host children from different villages during summer holidays.